A series of studies performed at the Mayo Clinic in Minnesota, Rochester and Johns Hopkins Medical Center have encouraged a 510 (k) clearance of the StatStrip, ” a finger-stick capillary testing meter for critically ill patients with or without diabetes.” The subjects utilized for these studies were between the ages of 1 month and 106 years old and all received medical care in intensive care such as the burn unit, cardiac, orthopedic, surgical or neurological. A total of 16,778 individuals participated in this study. Results concluded that the capillary testing meter showed the same glucose results as arterial or venous plasma results. The FDA has cleared the capillary meter to be a safe method to use on critically ill patients. Currently, StatStrip is the only approved glucose meter that can now be used with arterial, venous or capillary specimens from all patients, including those who are critically ill. The FDA clearance indicates that StatStrip is safe, effective and reliable for use by CLIA-waived operator for point-of-care testing that measures and corrects for abnormal hematocrit and has no clinically significant interferences, which can lead to the mismanagement of critically ill patients, the release stated. 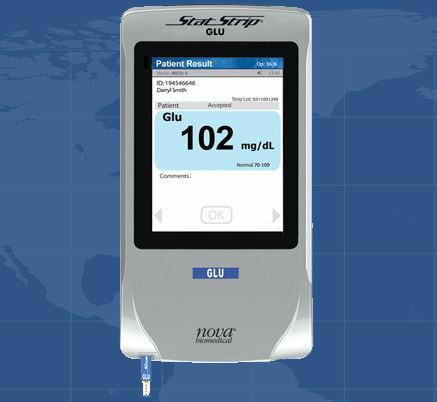 To learn more about the StatStrip glucose hospital meter system, visit FDA clears first glucose meter for critically ill patients. To view the full decision summary, visit Review Memorandum for a list of intended uses as well as all studies included in the decision making process.